Who here was surprised to learn that Facebook routinely censors conservatives? It's an open secret - if you post a politically incorrect opinion, there is a good chance you will get banned. It just takes someone reporting you. Todd Starnes of Fox News has a personal example (see the screen capture on the right). 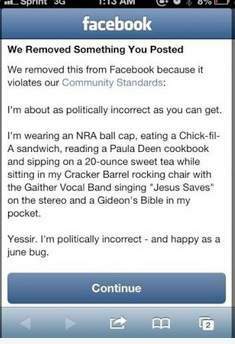 It's a great example because you have to wonder exactly what about it triggers the censorship - is it Chik-fil-A, Paula Deen, 20 ounce sweet drinks, Cracker Barrel, Jesus Saves, or Gideon Bibles? We take this report very seriously and are conducting a full investigation to ensure our teams upheld the integrity of this product. He is also now on a "charm offensive," inviting conservative media figures to meetings to discuss their FB concerns with him. Personally, I expect these guys to be fully charmed in no time - I have no expectation that any of these so-caled conservative media leaders will be resistant to Zuckerberg's immense wealth and celebrity. It's not like Zuckerberg does not have the right to run his company with whatever bias he wants. I believe he does. Its the hypocritical, lying mask of fairness over the extreme leftism that I object to. The simple, conservative answer for users is to walk away from Facebook (and maybe use alternatives like MeWe). But are any wars won by abandoning the battlefield? I know from observation that this is not what the Left would do in our shoes. In fact, how often have they leveraged being the fringe minority to taking over the whole organization? They've done this to our schools, our newspapers, our government bureaucracy. If Facebook were a right-leaning company that suppressed leftist thought, the leftists would be infiltrating it and gradually taking over. So keep the heat on Facebook and make them live up to their mask of fairness. Censorship is a tool of totalitarians. It is said that more people get the news from Facebook than any other media. People follow "trending" or whatever. If this is so Zuckerberg should be compelled to allow commentary. Not being upfront about their bias borders on fraud. When I first heard about pages being blocked because of complaints, I knew what the deal was. If you post something that was 'offensive' to some other user, they could complain and either take the post down, or the entire site. That was the strategy the left used against twitter and all the other social media sites. There were/are special buttons on the comments that say, 'to report this comment', you click the radio button, and invent a reason why the material is offensive. Get enough reports and your site gets taken down. Disqus has the same thing. Yup. SJWs love to swarm online. And offline too - see all the protests they do to shut down conservative speakers at colleges.